WAYLANDS Reading has opened the doors of its new £6m showroom. 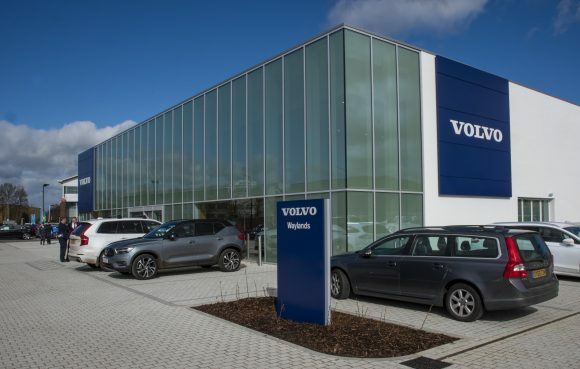 The Volvo dealership, which has moved from Bennet Road to the Reading Gateway development in Imperial Way, has room for six cars inside and can display 60 outside. Its signature lounge area has Scandinavian furniture, free wi-fi, cakes and coffee. Large exterior and interior glazing also lets customers see all activity taking place in the new workshops, which feature the latest equipment. John O’Hanlon, chief executive of Waylands, said: ‘I can’t wait for customers to visit Waylands Reading’s new showroom – the location is fantastic as the retailer is just off junction 11 of the M4. Paul Lambert, general manager at Waylands Reading, added: ‘The team and I are all very excited to unveil our new showroom. O’Hanlon formed retail group Waylands Automotive in November 2017 after stepping down as chief executive of Ridgeway the previous year following its takeover by Marshall Motor Holdings for £106.9m. Waylands bought Fawcett’s Volvo Newbury in May 2018, with Volvo franchises in Swindon and Oxford snapped up soon after.